If you go to a man's house and his wife says he is not at home, then, if you want to wait for him, your place is in the sitting room. You can have a glass of water or a cup of tea but you must not leave the sitting room at any time, except for the call of nature. You have no place even in the kitchen. I am speaking now as a Hindu. You will avoid a lot of problems if you follow the scriptural laws and I am telling you only that which is in the scriptures. I tell you these things because you are mine and I do not want you to be harmed in any way. I have to protect you, even from the gods. Some of you think that you can follow the ways of the Western world but you are not Westerners in that sense. You are Westerners only in an earning sense. One of the reasons why there are so many divorces in Hindu families today is because they are following that silly kind of life. This can happen anywhere and to our nearest and dearest ones. Gurudev [Swami Nischalananda Puri, Swamiji's Guru] was so strict. He would never let a man and a woman sit down on the quiet and talk. If one of the brahmacharis [novice monastic celibates] did this he would say to him, 'Go and get some tea. Go and do this. Go and do that.' But I have to tell you, that even with his great protection a lot of things happened. One day I was scolding one of the swamis for doing certain things. Suddenly he asked me, 'But how do you know all this, Swamiji?' I said, 'It is not that I am a great yogi, certain people told me.' He said, 'But isn't that gossip? You are not supposed to listen to gossip, Swamiji.' So I looked at him and said, 'Yes son.' It was gossip, but at the same time it was not gossip, when one looks at our relationship. What is my relationship towards him? It is one of protection, of a teacher and guardian guiding him. Sri Ramanuja was a great man. He took diksha [initiation into spiritual life] mantra from a sudra [labouring class person]. He bashed all barriers of caste, colour and creed. He held on to God and God alone. He was a great man - nay, a great Incarnation [Avatar]. Do you know why they called him Shesha? Shesha carried the weight of Lord Vishnu with his creation and Sri Ramanuja was carrying Sankaracharya's weight. He was the basis. God came first then the Shesha - yet the Shesha carried the Lord and his Creation. When you give a public talk you must first offer the whole talk to your deity. My guru used to say that you must select one person who responds to you in a crowd and talk to him only. Remember also that the microphone will magnify your voice. Gurudev [Swamiji's guru, Swami Nischalananda Puri] would ask me, "Inder [Swamiji's pre-monastic name], why do you shout so much?" Just lately I have stopped shouting. Do not let your association with a swami or an institution blind you to the ignorance that is covering you and I.
Devi or the Divine Mother is none other than Brahman [the indivisible Universal Consciousness] Itself. You will find that Devi worship, when rightly understood, is not separate. There is a kind of experience in Devi worship which is felt by the devotees, it is softness, love, compassion. This is also felt to a certain extent by the worshippers of Sri Krishna. Hindus do not realise that death itself is a kind of shakti [power]. You may see a stone and think that there is no shakti there. But imagine the shakti if even one atom of it was split. This shakti is none other than Brahman. Shakti herself is formless, quality-less and nameless. If anything she is called the Eternal One. Nowhere in the scriptures is this Divine Mother's presence more clearly demonstrated than in the Devi Mahatmyam. God is Omnipresent, Omniscient and Omnipotent. This embodiment cannot be thought of. Out of Him manifested this Maha Kali with thousands of legs and hands. She destroyed Madhu and Kaitabha the first obstructions to creativity. Later on this concept was given to man, that That which embodies Omnipresence, Omniscience, Omnipotence, time past, present and future, also takes us to the formless. Don't you see that when you sit for meditation post-nasal drip starts? [Swamiji imitates a cough] All that is just an excuse. A fiction of the fictitious mind. Swami Vivekananda says that we are not travelling from error to truth but from lower truth to higher truth, to the highest truth, until we reach the Absolute truth. An example of this is given to us: When a photograph of the sun is taken from many miles away it shows the sun as a ball of fire but if you go close to the sun there will be no picture of the sun at all - just light - the Absolute. Like this we are travelling from the relative truth to the Absolute truth. Sankaracharya realised that Absolute truth is supra-personal. Later on Swami Vivekananda explained that this was indeed the highest philosophy, the highest realisation; yet it was only good for a few people because it needed qualification. To realise this we have to give up the idea of the body - and yet we know that ninety percent of humanity is conscious of the body. Thus Sankaracharya philosophy is no good for them. The stepping-stone came in the realisation of Ramanuja. Sankaracharya's philosophy was being preached when Ramanuja stated that: ". . . Truth is the quality belonging to Brahman." It was actually Sankaracharya's philosophy that inspired this thought. In other words, Ramanuja discovered that part which Sankaracharya, for the time being, had not given. First is the quality, but the quality and the possessor of the quality become One. Ultimately you will find they are not two. You may say God is happy but you cannot say He is sad - He has no sadness in him. Ramanuja went on to say that, like the pomegranate, it is one fruit but still there is separation in it. There are many seeds - but one fruit. You cannot take away one seed and still say it is a pomegranate. Take a piece of cloth. If you pull the threads out, where is the cloth? Just like that the body and mind, the world and God, are interwoven. One depends on the other. The soul depends on the Eternal Lord. They are inter-dependent. Sankaracharya said: "A drop of water falling in the ocean becomes one with the ocean." Later on, when you reach that level, you will find out why Sankaracharya shows us (through his reasoning) that: Though there is unity and yet individuality, in reality this individuality has become One, has become Brahman. Sankaracharya's philosophy is the highest. The saint, in his realisation of oneness with God, says, "I have found that One from which we have all come and from which even this world has been projected." That is the Absolute, the highest. "Whilst we are dependent on different or individual bodies, we are parts of God and yet we do not become one with Him," said Ramanuja. That too can be contradicted through different arguments - but we do not have to go through that here. In olden times the man did the tapasya [austerities] and his wife worshipped him as God. When he died, she wanted to be with him, and to take birth with him again. So she sacrificed herself on his funeral pyre. [*see footnote 1] That is spiritual sacrifice - that is why she did it. But today the men cannot do that, but they [the remaining family] still force the wife to do it using drugs, injections etc. Lust, anger, greed are open doors to hell. Every second you must keep a check on it. Why did Krishna say, “Lust, anger and greed are the open doors to hell”? Because he made heaven and hell and he knows. Do not go about fault-finding. If you go to the vegetable market and see a sheep’s head, it is just something in the wrong place. Footnote 1: Swamiji was referring to the now legally-outlawed practice of sati or suttee (self-immolation) in India. Footnote 2: The Ramakrishna Centre of Southern Africa [temple pictured], founded in 1942 by our beloved Swami Nischalananda [Swamiji's Guru], was housed in a delightful but rickety old building on the Avoca site. From the late nineteen 80's until his mahasamadhi (passing on) in 1994, Swami Shivapadananda worked tirelessly to raise funds for the construction of the magnificent temple and administration complex which today graces that same site. Swamiji oversaw the project to almost total completion before he left his body. 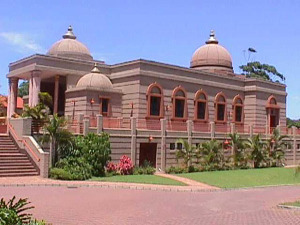 The Centre has now been handed over to the worldwide Ramakrishna Mission and the Durban ashram is under the Presidency of Swami Vimokshananda. You may ask: What is the need to have Ramakrishna Consciousness? You may love Hanuman [the great god-devotee of Lord Rama, who took the form of a monkey], Kali [counterpart to Lord Shiva], Buddha or Christ. But we look at it through the eyes of Ramakrishna, our teacher, so we see what Master realized. But we still worship the Divine; that which we always worshipped. Hinduism is flexible: I love Hanuman, but you force me to worship Rama, [regarded by Hindus as an Incarnation of God] Rama can become my guru, [teacher/preceptor] and I can still worship Hanuman. Take up the holy Name, the holy Form. It is a special manifestation. Then this gradually leads to That. Thus, from the form to the formless, from the name to the nameless. To worship God as a male or a female is not the highest stage. Swami Vivekananda used to go about America saying: 'We are all Brahman.' What you are within you see without. Swami Vivekananda was Brahman, so he saw that everything was Brahman. If within you see that you are Satchidananda [existence, knowledge, bliss absolute], then outside you will also see others like that. We think our forms are real. Let us rather think we are the soul, not the body and mind. Think of yourself as a point of light. [Sw.S] That is a very beautiful meditation – but only for those that like it. Or, you think of yourself as an ocean of light and merge in it. Book: Always remember you are a soul that wants to put on a body and mind to play in the drama of life. You must also be playing in the world of spirit. [Sw.S] Such a beautiful feeling that is. 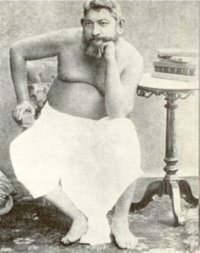 Girish [Chandra Gosh - pictured above - a famous Bengali playwright, actor, womaniser, heavy drinker and character of note, who was utterly devoted to Sri Ramakrishna] came drunk to Master and said, ‘I am a sinner.’ Sri Ramakrishna said, ‘Who told you you are a sinner? You are Brahman!’ Master saw Brahman inside and so he saw Girish as Brahman. Transformation must happen. Imagine you are spirit. That is the greatest secret of sadhana [spiritual practice]. Slowly you will be de-hypnotised from the body and mind. But we are not imagining this, and so we make no spiritual progress.